Riverbend Ogden: What is Riverbend? 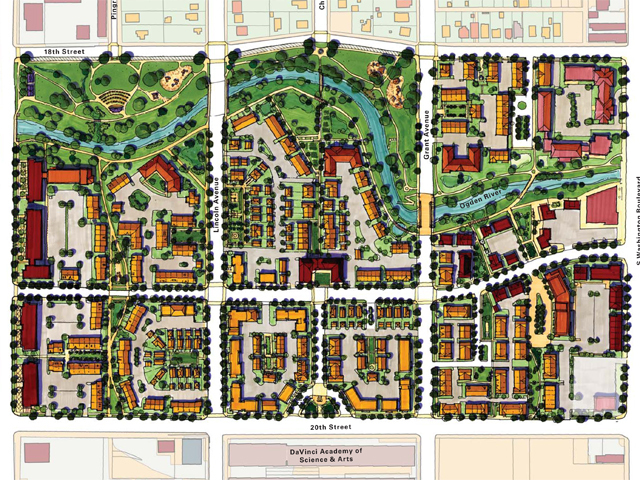 The Ogden Riverbend Redevelopment master plan offers a rich array of housing types and sizes in a walkable neighborhood setting. The river experience is enhanced with parks, open spaces and trail systems that provide recreational opportunities as varied as fly fishing, kayaking, running and cycling. After a recently completed $5 million restoration project, the Ogden river has been designated a Blue Ribbon trout fishery. Commercial development on the eastern side of the plan is intended to be more neighborhood-serving destinations. Campus-style office buildings will enhance Riverbend’s vast open spaces to complete the walkability and desirability.